And I've based those arguments on where such bodies get their money from, and whom they're trying to curry favour with rather than asking us what their priorities should be; (don't believe me? Think back to the last time a sector body you're in membership of openly asked you what they should be doing on your behalf, openly published the results, and then reported on how far they'd delivered against those). Some of you also know that I have a habit at looking at published research and data - not as a trained mathematical/economic analyst, but rather as an 'enthusiastic amateur', to see what new (or contradictory) stories they might offer to help us better understand ourselves and the issues we face. And my latest 'rummaging' concerns the NCVO's Almanac and Social Enterprise UK's 'State of the Sector' survey. And the reason for picking these two august bodies? I'm refreshing some of the training courses and materials I deliver around governance in the sector, and though it might be interesting to see what both sources have to say about latest trends (as they both map legal forms adopted in the sector, and both published their current findings for the same year: 2017). 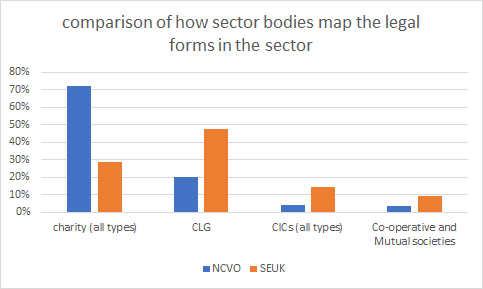 But so what you might say (and perhaps rightly so) - NCVO is concerned with those organisations who are predominately volunteer dependent (hence the title), whereas SEUK is concerned with enterprises that are trading - so we'd expect to see a difference, right? 1) Policy makers, funders, and commissioners all group charities and social enterprises together into a single pot (hence the term 'civil society'). They don't differentiate in the way that our sector bodies do, so when they come to make policy and pass legislation that will affect us, how can we have confidence they're making the right choices when the data we're presenting them with to do so appears to be so contradictory? 2) Where the data comes from. NCVO's Almanac draws upon several external, objective, and credited sources, so should be pretty sound. SEUK's data is largely a collation of the returns they've received to a call for survey responses from groups in the sector - so their data is only as good as the people who fill out the forms. And that could be more of a problem than we'd like to admit: as a result they list sole traders as recognised legal types of social enterprise in their report (not sure anyone else would? ), and 6% of all the CICs who responded weren't able to identify or be categorised as to whether they have share capital or not which, when added together with the other 'uncertain' responses, shows that over 10% of all respondents whose data has been collated and published as reflecting the realities of the sector today don't know what their legal form is - so how can we trust that they'll be any more accurate in other data that they give? Let me put this another way - if we were building a house wouldn't we want to have confidence in the nature of the foundations, and that the way they'd been created would subsequently stand up to scrutiny from a variety of inspectors and other builders to ensure that what we're building doesn't come crashing down around us in the future when the weather gets rough..? If the data we use to act as the comparable 'bedrock' in shaping support, interventions, and lobbying for the sector is found to be suspect in the future, isn't there therefore a risk that a lot of efforts now would be wasted, hence why it's important to make sure we test such data today..? As with any mapping exercise, there will always be ways in which the methodologies used, and the way the analysis on data captured can be criticised. My reason for doing so here isn't to belittle or reduce the efforts of these 2 bodies, but rather encourage us to pause before citing an 'official statistic' about our sector to make sure that we can be confident that it really is accurate, and in everyone's best interests to be using for the reasons we are. There's a problem in the wider business community that's affecting everyone (and our livelihoods), and it's getting worse every year. It's a problem that people struggle to feel able to talk about or openly challenge. And it's a problem that's increasing the risk of pushing us back into recession, and leading to further business closures and job losses than we're already seeing and hearing about in the media. And it's not red tape or (mental) health - it's money. More specifically, the challenge of late payment: customers who commission us to deliver work and goods for them, and then suddenly get out the big book of excuses when it comes to paying us what was agreed, so that they can hold onto the money that's rightly ours for longer. It disproportionately hits small businesses and the self employed like me, as we don't have big financial reserves to cash flow the work, or employ finance teams who can chase up the money on our behalf (we have to take time out of earning from other work to do that ourselves). We also can't easily use the courts to chase the money, as that costs more cash and time to pursue, and also risks damaging our public reputation. And when the cash runs out for us because we've not been paid the money we're owed - it's game over. Our enterprises fold, and we lose our livelihoods along with anyone we're employing. And for what reason? So that some larger corporate can hold onto the cash (which they already have plenty of) for a little longer. It's currently a £14.9bn problem, with the typical small business owed £11,000 and spending nearly a day a week trying to get the money paid that they're owed. £14.9bn seems an overwhelming amount that nothing can surely be done about. Government have created a post of late payment commissioner to help change this culture, but they've had little (if any?) impact. So what can a sole trader like me do about it? Well, I can make a pubic commitment to always and openly paying my suppliers on time (if not early) through being certified as a 'Pay On Time' supporter. I can constructively challenge customers and clients who start to drag their feet in paying me what they owe me for my efforts on their behalf by using the Late Payment Act legislation (very easy and surprisingly effective!). And I can do this openly and in a way that hopefully encourages others to start to do the same - and if you're reading this, that that means I'm challenging you to do the same! Government have shown that they can't fix this problem, but the tools are there for us if we have the conviction, leadership, and resolve to get the job done ourselves.